When I was doing research for the book, I gathered as much information about Elvis’s tours in 1957 as I could find. Since Elvis ’57 was published, however, much more about those concerts has come to my attention through various sources. Since it’s too late to include that material in my book, I’m passing newly discovered information about Elvis’s “final fifties tours” in this forum. So here’s some additional “fascinating stuff” about Elvis’s 1957, appearance in Spokane, Washington. Here are the basics. 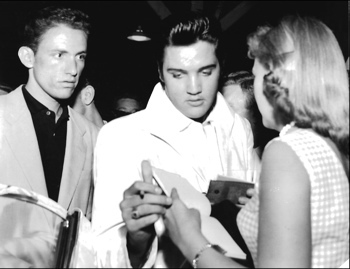 After a two-day train trip from Memphis, Elvis arrived in Spokane late on the evening of August 29, 1957. The next night he opened his four-day, five-city Pacific Northwest tour with a concert in Spokane’s outdoor Memorial Stadium. After the show that evening, he caught a train to Vancouver, B.C., for an appearance there on August 31. In my book there is a photo of Elvis signing an autograph for a girl soon after his arrival at Spokane’s Great Northern station. That picture appeared, along with a excerpt from my book, in a local history magazine, Nostalgia, in August 2007. Soon Gaylene Moos Pope, who lives in Wenatchee, about 150 miles west of Spokane, contacted the magazine publisher. 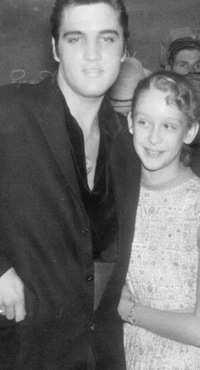 “What a shock to see the picture of Elvis signing an autograph for a young girl in your last issue.” Gaylene recalled being at the train station that night. When teenager Karen Larson first heard Elvis was coming to Spokane, she wrote to Tom Diskin, Colonel Parker’s assistant, asking for a back stage pass. 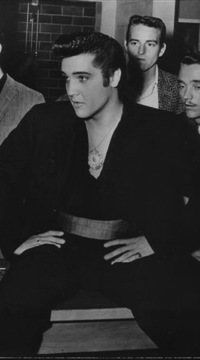 The day of Elvis’s show, Diskin called to tell Karen to report to the dressing room at the stadium to pick up her pass for the press conference that Elvis would hold there before going on stage. The following is an excerpt from her online account of her meeting with Elvis. Nostalgia magazine asked readers who had seen Elvis in Spokane in 1957 to send in their memories of the event. Following are a few of the responses that appeared in the magazine. "Oh my gosh, he’s really coming right over to us. My heart was pounding. I just kept looking at him. His hair was dark black, shiny clean—not greasy. His complexion was beautiful."